Now, many years after the end of World War II, it may seem incredible that our most valued institutions and way of life were threatened by the menace that Hitler and the Third Reich represented. Shirer’s description of events and the cast of characters who played such pivotal roles in defining the course Europe was to take is unforgettable. Benefiting from his many years as a reporter, and thus a personal observer of the rise of Nazi Germany, and availing himself of some of the 485 tons of documents from the German Foreign Office, as well as countless other diaries, phone transcriptions, and other written records, meticulously kept at every level by the Germans, Shirer has put together a brutally objective account of how Hitler wrested political control of Germany, and planned and executed his six-year quest to dominate the world, only to see Germany go down in flames. This is a richly rewarding experience for anyone who wants to come to grips with the mysterious question of how this menace to civilization ever came into being, much less was sustained for as long as it was. The answer, unfortunately, is that most of Germany, for a whole host of reasons, embraced Nazism and the fanaticism that Hitler engendered. ©1990 William L. Shirer (P)2010 Blackstone Audio, Inc. I always buy a long volume with trepidation wondering how many "dry spots" or "dry epochs" will be contained therein. This volume was amazing in that I was fascinated and interested every minute. The story focused on the characters while the overall picture was interwoven in their interactions and lives, particulary Hitler of course. The details added to the interest rather than extend it unnecessarily. This is a book that I will very probably savor again. I enjoy history and military history and this is probably the best I have read. The book will hit you at a visceral level and be prepared to listen to it beyond your normal listening routine. It's not a history of the war. The war is treated as a background character to the machinations of the political intrigue that transpired. The book is a series of stories with a narrative that ties them all together. Be prepared to listen to 8 or so hours about a single topic such as the run up to the incursion of Austria or the invasion of Poland. The book is not a set of sound bites but is mostly exhaustive details on the political intrigue surrounding the topic. Why can't all readers be as good as Grover Gardner? I had ran out of science books on audible to listen to and had low expectations for this book. My expectations were wrong. Of all the books I have read covering the Nazi era this is simply the best book of its type. Nothing else comes close to its readability and scope, and Shirer's presence in Germany as a reporter at the time allowed him to add many personal observations that add greatly to the authenticity of the book. While the book is now about 50 years old, research since its publication has changed few of its conclusions. It is less academic and detailed than Richard Evans triology of the period, but I found Shirer's book both more complete in its observations and much more readable. The quality of this book is evident from the fact that in all of that time, and with all of the books on the period that have been written, this book has never been out of print. And though it needs nothing else, Grover Gardiner's flawless reading only makes the book even better. This is easily one of the 10 best books I have ever read from Audible and I recommend it without reservation to anyone with an interest in World War II in Europe. A word of caution - this is not a dispassionate book. Shirer had definate opinions and those are not hidden. His distain for many of the primary players is clearly evident in his descriptions and that may offend some readers. This is not an academic book (See Richard Evans' Nazi trilogy for a dispassionate academic telling of the period), but no other book comes close to its readability and comprehensiveness. It covers the political events and there is no concentration on the war (see Richard Atkinson's WW II military trilogy for that). Never before had I read a firsthand account, from primary sources, as damning as this book. All of the negative superlatives that one could pen I have not the number of commas in my repertoire to string them together. You get a striking picture of Hitler, who he was, what he did and how he failed. As grotesque as he may be, the intellectual flyweights he surrounded himself with defy understanding. How, intelligent and gifted military leaders allowed themselves to be led into the manifest slaughter of innocent people – well I have no words. Read the book and you too will be speechless. The book is built on primary reference materials and hence, I confess, unless I had listened to it, I would not have been able to get through it. It is essentially a 50 hour audio documentary. Although I could not listen at my usual three to four hours a day because I was so disturbed and depressed by the subject matter, I had to finish. And, to think, how close Hilter came to winning on at least four occasions makes me breathless about what evil he would have wrought and what the world would have been like today. Hitler came to power and in twelve short years of rule and conquest - five of them in war - caused over 30 million people to be killed, not mention the number of people forced to kill on his behalf or to fend off those trying to kill them. It is a testament to how a single perverted point of view with power to influence the masses can spin lies and deceit that move ordinary people to be puppets. Looking to today’s world situation, you have to ask yourself whether parallels exist. You must listen to this book! I also highly recommend the Winds of War and War and Remembrance by Herman Wouk which is a true story set with fictional characters. For a Japanese view of history, read Flyboys by James Bradley. This is must read for a serious historian. Do not expect to find gruesome details; expect to find a documented story that causes you to reconsider history and today’s world. Mr. Shirer wrote this book in the '50's, while the second world war was still very fresh in everyone's mind. While some of the advantages to examining the events that occurred after many of the principles involved had passed are clearly evident, I was very enlightened about the events that led to the rise and fall of the Third Reich. It is very evident that Mr. Shirer has certain biases that were widespread during that period. However, even that frames the events in a way a more open acceptance would not be able to do. This was a great listen, and I found it captivating. It might be 50 years old, but William Shirer's book is just as gripping and just as important today as ever. It is amazingly well researched and the perspective of someone that was a close and personal observer to much of the Nazi period. Yes, it is long. At 57 plus hours, my wife reckons I've listened to Grover Gardner more than I've listened to her in 15 years of marriage. But Mr Gardner stays claim and steady throughout and never gets upset at my "what?" His narration is absolutely first class. One can't imagine a better combination than Shirer and Gardner. In the 1990's I listened to the older BOT cassette version of this work read by Larry McKeever. He did a good job. To have this redone by Grover Gardner is a HUGE gift to us all (Thank you Grover). He does a much better job and his European pronunciations are very competent. I have read that Shirer's work is not liked by many historians in this field (especially by the Germans) but I find his writing to be on par with the great narrative historians (McCullough, Caro, Chernow, etc.). I am also listening to Richard Evans's Third Reich trilogy and, although its more thoroughly researched, his writing is not near Shirer's in elegance. And the reader is not near the quality of Mr Gardner. One of the lessons learned from this tragic story is that numerous and fractured political parties can lead to disaster for everyone. I've spent my life hearing important WWII stories, but never managed to have quite the sense of context needed to understand how they all fit together. This book analyzes the most important factor of the war -- Hitler's Third Reich -- in minute detail from the beginning to the end. And in so doing, provides the reader with a amazingly thorough understanding of exactly how the world landed in the mess it did. This work of exhaustive research, beautifully composed and narrated, should be required reading for anybody who values democracy and peace. I rarely read historic works, but I'd heard that this was THE book on the subject and was compelled to find out what the fuss was about. I had to go back and relisten to sections quite often, but it was worth every rewind to make sure I had the players straight. The minor failings for me are: Shirer is quite biased against Germans in some statements. If I were German I would find it a bit patronizing. Also, Shirer, a man of his times, makes no bones about his homophobic leanings. But, it is a book of its time and these biases situate the reader more firmly in that time with Shirer, who lived it as an observer. I found that I was discussing the book with my partner, who was also listening to it, quite a lot. We were making comparisons to other, more recent political happenings and finding that quite a disturbing prospect. The audio book is also masterfully read. This reader is gifted and the absolute perfect, grave and strong voice for this. Grover Gardner is a good choice as narrator for this long, disturbing, and important book. As he did in Shelby Foote's three-volume history of the Civil War, Gardner shows himself a master of keeping the narrative going and keeping the details clear. William Shirer apparently got a lot of grief when the book was first published (some 50 years ago) -- a journalist trespassing on the domain of historians -- but he seems to have read every Nazi document that had been made public at the time, and combined with his razor-sharp eye-witness accounts of several key events, the book has an immediacy that few other histories are able to convey. I'm sure many of the facts have been refined, and I hope to finish listening to Richard Evans' recent history of the Third Reich as well, but I doubt that later volumes will have the same visceral impact this one did. This was the standard book at school 30 years ago for the study of the Third Reich. Reading it all these years later it has lost none of its impact. The writing style remains modern and clear and in my opinion is unmatched on the subject. Many good books have been written on this subject but Shirer witnessed events with his own eyes meeting many of the historical figures and seeing the bodies before nearly becoming a victim himself. Written in a time when reporting was still a noble art it was criticised as being anti German. For me it lays the facts out and leaves the reader to make his mind up. Despite its length superb narration makes this a stunning a thought provoking listen. Find the time. Finished - what do I do now? I listened to all 57 hours in one month during many long drives and not a few late nights. Rarely have I enjoyed history so much. The quality of Shirer's writing has long since been recognised, but this is enhanced even further by the brilliant narration. Yes, there were occasions when my concentration lapsed, but ony because one is inevitably drawn to one aspect of the story rather than another. Most often I was riveted, and now it feels like an old friend has said farewell. This is a monumental listen which despite its length flies along as the events unfold. The reader is very easy to listen to and never becomes a trial or gets in the way. Awesome, epic and illuminating. The examples of demagogues and schemers portrayed remain as relevant in our times. An absolute masterpiece. Strongly recommend it. This is a truly masterful and objective history of the third Reich based on the mountains of captured Nazi documents after the war and therefore is not subject to a particular historians interpretation of events. Although long and sometimes a little difficult to digest due to - for example - the large number of individuals dealt with, this book is nevertheless an incredibly thorough coverage of Hitler's rise to power that will reward the reader with a wealth of knowledge throughout its scope. This has to be one of (if not, the most) complete treatment of the subject matter. I was amazed to read actual extracts of conversations that had been carefully documented with typical German efficiency. There is just so much here that I find it amazing that one man could write such a mammoth volume. A word on the narration; This could be a most difficult book for a narrator due to the frequent use of German names, places and other foreign language references. However, this is handled with superb skill by Grover Gardener who's delivery is both confident and precise. It is not surprising then perhaps that he has narrated some of the largest and complex volumes on other matters such as the American civil war. In summary, this is a long, but worthwhile masterpiece of work into some of history's darkest days which offers incredible insight into the mind of one of history's most infamous men. Germany under the Nazis is probably one of the most written about periods of history and the seeker after information is spoiled for choice. 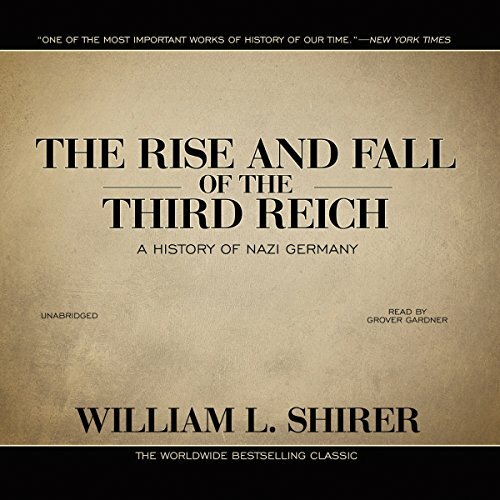 Plenty of more recent studies have been done on the Nazi era but Shirer's work, now half a century old, still stands for me as the definitive history of the period. Of course, it has many flaws, not least Shirer's own very subjective take on the personalities and the events he documents. Shirer was a journalist, and he wrote as a journalist, not as an historian. But what the book might lack in terms of perspective, it gains tremendously in recounting Shirer's own first hand experiences of Nazi Germany. He lived and worked in Germany during the early days of Hitler and personally attended many of the events he described. he was also fortunate, as he describes in his introduction, to have been present when German government documents were seized by the advancing allied armies and to have been one of the journalists allowed to comb through this rich source of information. He describes, with frightening clarity, the failure of Britain, France and America to understand the danger posed by Adolf Hitler and the terrible results of the pre-war policy of appeasement, not least for the many millions who died in appalling conditions in Nazi extermination camps. The reader shares his frustration at the willingness of the western powers to sacrifice Austria and Czechoslovakia in order to buy a few more months of peace. This is a very long book which I read first when I was in my teens. The audio version is unabridged, and runs to an incredible 57 hours but the narrative will sweep you along. The reader perfectly captures the tone of the written volume. For those who want to find out how a madman can come to power in what should be a civilised country, there is no better source than this book. Don't be put off by the length the reader of this fabulous audio book captures you and continues to hold you as the history of Nazi Germany unfolds. The book itself remains a classic of World War II covering the broad history of the Third Reich from first tentative developments to the downfall and collapse in the Fuhrer Bunker. You will find it difficult to do anything else until you finish listening. The producers and reader have remained faithful to the work and the horror of a world war without getting dramatic. You will only find a few works that achieve the quality you find here. This book is nothing short of astounding, and has kept me gripped for over 2 months on my daily commute between London and Coventry. Having an interest in WW2 I have read many books on the various aspects of the war, but none even come close to this title. It is meticulously thorough, and sets out the background to not only when and how Hitler came to power, but also the circumstances and national psyche that enabled him to do so. I've also been surprised on many ocassions by how people we thought we knew have so many other sides to them. Mussolini the Peacemaker? Who knew? Grover Gardner is outstanding in his part as narrator of this dark and yet fascinating story.I cannot imagine anyone doing a finer job. An absolute must-have title for your collection..
Wow, what an audiobook. It was long, but I can't see how this particular book could have been shortened. It's all based on diaries, letters, minutes, logs of phone calls, direct quotes and other direct sources than just other historians material. This makes it all more compelling. Some parts are a little heavy - but that's to be expected, and they don't last that long. The whole period is truly staggering and to here details of it in such detail is truly amazing. Don't be put off by the immense length of this audio book: it's a riveting story that keeps you listening. I first read this book over 30 years ago and, though I had forgotten much of the detail, the power of its narrative had left an indelible memory. Listening again, rekindled the shock and amazement at this dark period of history. At times harrowing, it's like a fast-moving crime thriller. And, oh what crimes! What's so shocking is that it wasn't just a small band of psychopaths who had taken over Germany, but that so many people were willing to perpetrate unbelievably cruel treatment on other human beings. With the benefit of hind-sight one can see turning-points that changed history and the many missed opportunities by both sides to triumph or be defeated; or for peace or continued conflict. It's fascinating, if chilling, to see how Hitler started out as a consummate tactician, but latterly sunk into a megalomania that ruined his country. The book had involved an immense amount of research into captured secret papers of the Reich and greatly benefits from the author being an eye-witness working as a journalist for a US broadcasting company at this tumultuous period in history. I've only listened to half so far, and its gripping stuff. Not dry dull writing, but its alive, full of personalities and happenings, one steamrolling onto the next. And the reader is excellent. While its v.long, and I'm not sure I'll take it to the end, I dont think this matters, because its fantastic value, even if I only listen to the first half, as my main interest is in the rise of nazism.